It’s important for me, as an Iranian Muslim woman, to take up space. My narrative and identity are being constantly misrepresented, silenced and ignored–whether that is virtually, by way of audience at a panel event, or simply being constantly dismissed as angry and emotional. 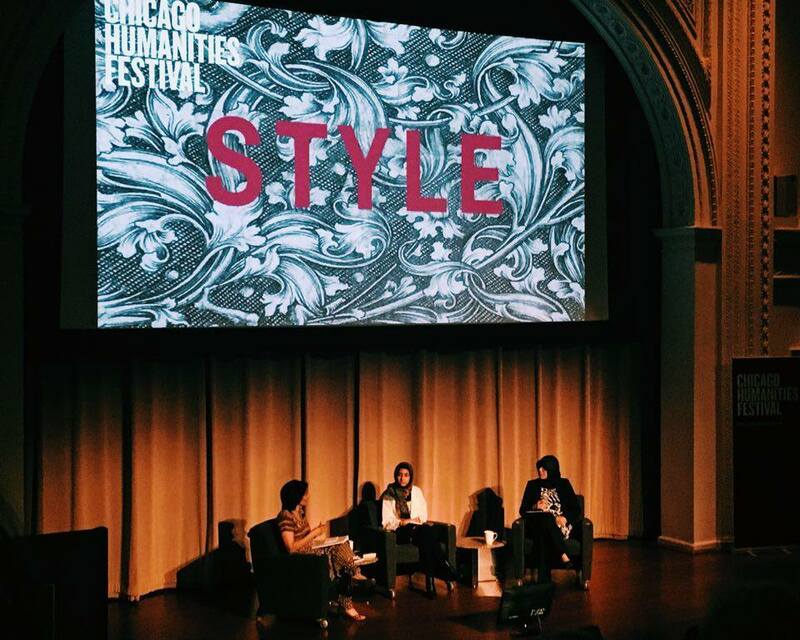 A few weeks ago, I spoke on a panel at the Chicago Humanities Festival on the presumed topic of “Hijab and Fashion” with Asra Nomani as my co-panelist. Initially, I was asked to speak on the topic of my book, Tehran Streetstyle, as well as the current state of fashion and modeling–both legal and illegal–in Iran. However, finding a co-panelist to speak alongside me on this topic was not the easiest task in the world (understandably), and so the conversation was opened more broadly to focus on the topic of hijab and fashion. Asra Nomani, a self-proclaimed “Muslim feminist,” does not wear the hijab. This is not unusual, of course, as the hijab is a choice that Muslim women make. Asra argues that Saudi Arabia and Iran are funding a sort of “radical” Islam in which the hijab is mandatory and normalized. The hijab, Asra argues, is both inherently oppressive, and acts as a symbol of the funding and preaching of “political Islam” across mosques and Islamic institutions in the West and around the world. To be fair, though, yes a few governments around the world have a set of oppressive dress codes that should be rightly condemned (as I do in my book, as I did on the panel numerous times, and as I do anytime the subject is provoked in conversation). France and Saudi Arabia, for example, both either require the wearing or restriction of wearing a particular form of dress, and therefore both are examples of patriarchal rulings ordering women to dress a certain way—either in the name of secularism or “Islam” (but of course, as an Islamophobic “feminist,” only the latter is distinguished as problematic). Asra’s focus on the actual economic and political problems in the Middle East and their implications for women’s lives is scarce. More importantly, she fails to note the major American and European powers’ complicity in creating and perpetuating such post-colonial patriarchal systems of oppression. She points to Saudi Arabia as an example of the implementation of compulsory hijab, but ignores the fact that the Saudi monarchy is supported by the United States and has been a strong ally for decades. She constantly brings attention to the violence that is perpetrated in the name of religion but somehow never mentions the messy political, economic, and social situations that Western powers have caused with their imperial and colonial projects–ones that work to create spaces and situations in which oppressive power structures and their inherent violence thrive. She wants to discuss ISIS, but doesn’t want us to talk about the U.S. invasions of Iraq and Afghanistan that worked to destroy and destabilize the region, directly leading to the creation of ISIS. She calls on those in power to “wake up” and increase surveillance of mosques, yet fails to note that the majority of terrorist activity in the U.S.is conducted by white men. And this doesn’t even count the countless police shootings across the country. In addition to her ideology that consistently renders those who wear the hijab as backwards and oppressed—at time of heightened Islamophobia globally, no less—Asra uses her public platform to vilify hijabi women. For example, when one of Asra’s male followers on Twitter criticized my choice to wear the hijab, instead of defending my choice to do so (as she so claims to support free choice), Asra had the audacity to compare my views to ISIS and Boko Haram, despite the fact that these groups have killed more Muslims like myself than any other group of people. These comments, while simply incorrect according to countless academic studies and institutional data, only contribute to amplifying surveillance and racial profiling in Muslim communities, and perpetuate hate and violence towards hijab-wearing Muslim women in the USA. Not to mention that Asra’s views are rooted in orientalism: a particular Eurocentric lens through which I, and people like me (Muslim, from the Middle East/West Asia, etc) are, reconstructed and redefined in order to be strategically silenced, ignored, and murdered. Western literature and thought, he maintains, creates and perpetuates the archetype of a docile and submissive Muslim woman due to her religious leanings, and renders Islam as a homogeneous, controlling, and backwards institution. Western media strongly associates Islamic clothing—more precisely the women’s hijab—as an oppressive instrument designed to render women as submissive beings. (This is also wrought with patriarchal tendencies of obsession with women’s bodies and how they chose to dress.) Therefore, according to this logic, the more a woman covers her skin and dresses in accordance with such widely-held interpretations of Islamic faith, the more “backwards” and “submissive” she is consequently depicted. And the more “backwards” someone is described, the more reason to go and “save” them, right? Saba Mahmood calls this a sort of colonial feminism: Using the veil as the symbol of ultimate oppression, and therefore requiring a Western colonial and imperial project of liberation. AKA, using the lens of orientalism for a particular political end. Speaking of political ends, a month before speaking on the panel with me, Asra testified to the United States Department of Homeland Security (which she denied on stage) that the hijab is on “the conveyor belt to radicalization,” and that “poor women come to believe that to be pious…you must look at the world through this netting,” while holding up a burka. Despite the fact that these comments are drenched in orientalism, her position suggests that millions of women are brainwashed by men, and none of their choices are the result of their own decisions, desires, and understandings. Super feminist, right? Asra is not only provoking violence and hatred, but she is denying our experiences and pains in this country as Muslim women who choose everyday to wear the hijab. A survey conducted in the last year (before the shootings at San Bernardino) found that 55% of California Muslim students reported being subject to faith-based bullying. Doctors around the country have seen a rise in mental health issues such as depression, anxiety, image issues, and paranoia among Muslim youth. The foundation of feminism, all inter-sectional feminism at least, is the right for women to freely interpret and chose what they feel is personally liberating to them–whether that is shaving your legs or not, wearing a scarf around your head, or neck, or not at all. Much like any other faith or belief system, Islam is a pluralistic religion with a myriad of interpretations, understandings, and practices. Not all Muslim women wear the hijab, and not all who wear the hijab do so for similar reasons. According to the countless blog posts and articles and emails and tweets and Facebook posts that have been used to harass me, I am characterized as very “angry” and therefore dismissed. I never feel compelled to reply seriously to hate/harassment/mischaracterization, but this is a common tactic used by Islamophobes, racists, and Orientalists alike to characterize particular minority groups–especially Muslims, Middle Easterners/Western Asians, Latinx people and Black people. So, I want to say that yes, I am absolutely angry. Anger is righteous. Anger is powerful. Anger is valid. And my anger is justified. These topics are deeply personal to many people, including myself. On a daily basis, I have people on the street yelling Islamophobic comments during my commute. For me, this is the new normal. Islamophobia has always happened to me and many other Muslim women wearing the hijab, but in the last several months, it has transformed from an occasional occurrence to a normalized part of my life. Here’s what I have to say to the haters, though: Every morning, countless Muslim women around the world wake up and make the choice to tie a scarf around our heads. And guess what? We find liberation in that choice. We find not only a spiritual connection with God, but a beautiful bond with one another. And we’re not losing sleep over your internalized islamophobia and twisted Orientalist ideologies, so why don’t you move along and “save” someone else? Peace. Denying the experiences of women who wear hijab is not feminism. My religious beliefs are not yours to homogenize. We’re going to keep doing our thing. Hoda Katebi is an Iranian-Muslim anti-capitalist fashion blogger at JooJoo Azad and recent author of the book Tehran Streetstyle, the first-ever collection of modern streetstyle photography from the streets of Tehran, Iran. Her work, which has been featured across various online, in-print, and television media internationally, uses fashion, photography, and writing to challenge the status quo and reclaim personal narrative. Find her on Insta, Twitter, Facebook, and Snapchat (@hodakay). These Healthy Snack Bars Made With Black Seeds Are Delish! yes, yes, and yes again please. Alhamdulileh thank you for writing this. Just, thank you. I learn so much from you Hoda! This is an awesome article. I recommend it to everyone. “She wants to discuss ISIS, but doesn’t want us to talk about the U.S. invasions of Iraq and Afghanistan that worked to destroy and destabilize the region, directly leading to the creation of ISIS.” I heard a similar statement from a reporter on NPR saying that George Bush has created ISIS with the Iraqi oil money! You were acting very immature and emotionally charged in the discussion. You interrupted with the attempt to make a clever comeback but failed terribly. You also used your western privilege as a sole defense to her claims. Next time go prepared and be patient and respectful. The entire video was cringe-worthy. Brilliant (times infinity) article! Absolutely on point and LOVED it!